Three great programmes on one DVD. The Summer of 1989. This video captures the excitement of the special events put on by the council marketing department. Join in the fun at Southend International Air Show, the motorcycle rally and the Last Night of the Proms in Priory Park. There's street theatre in the High Street, the Thames Barge Match, the last ever Fun Raft Race at Thorpe Bay and the famous carnival. Southend-on-Sea - The Place to Be, captures the excitement of these memorable events. Running time 29 mins. Colour. Driving Through Essex. The year is 1947. Essex Police decide that the time had come to set up a traffic division. Two constables are sent out to film our behaviour on the highways and byways of this county. Their film captures a snapshot of life in Rayleigh, Brentwood, Romford, Chelmsford and Clacton as the county returns to normal after the Second World War. Running time 20 mins. Black & white. Essex Floods 1953. Filmed in the days just after this tragic event. Produced to show how the emergency services coped with reconstruction of the breached defences around our coastline. Featuring footage shot on Canvey Island, Jaywick and Harwich. Running time 9 mins. Black & white. Extra Feature: Down Memory Lane with Jim Worsdale. Recorded in the early 1990s, these two audio programmes feature the recollections of local people. They recall Southend in its heyday as a seaside destination. The war years, the floods of 1953, and much more. 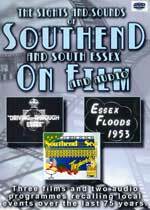 The programmes are hosted by Jim Worsdale, for so many years editor of the Southend Evening Echo. Running time 100 mins. Audio only.